On March 6 Town Manager Robin Crosbie conducted a budget review for the upcoming FY2009 at Glenbrook Middle School. Ms. Crosbie as required by the Longmeadow Town Charter prepared a “balanced budget” for an upcoming review by the Select Board. The full Budget Report is now available online for review. In addition, the slides used for this presentation are also available. 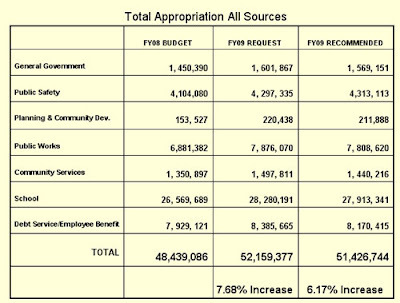 The total FY2009 budget is $51.4 million which is a 6.17% increase vs. FY2008. A key part of the budget is the impact of Proposition 2½ which limits the amount of increase in property taxes to 2½%. 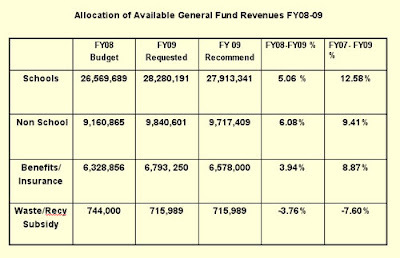 Total revenue from property taxes is ~ $35.8 million which is an increase of $995K over FY08 (see above table). With rising costs across many areas, Ms. Crosbie stated that with the proposed FY09 budget it was not possible to maintain level services. Below are two tables showing the increase of fund allocations for various portions of the town budget. LongmeadowBuzz is interested in questions from town residents for the Town Manager, School Committee, Finance Committee and others involved in the budgeting process. We help to provide information that will make this year's budget process a success. Add a comment to this posting and we will try to get an answer. See our help section for posting a comment to this blog. I am not sure why some people in Longmeadow are all that upset about their water bills. If you use a lot of water, then you should pay more than those who use less. If you own a swimming pool and you irrigate your lawn, you use a lot of water and you should, if you are reasonable, expect to be charged more for it than those who use less. As a public service, here is my water usage and water costs for the last five (5) years. As a few words of explanation: I am a single occupant of my house; I do not water my lawn; I do not own a swimming pool; I hand water my tomato plants. If we reduce the amount that the large users pay, per HCF, we will have to increase the amount the small users pay, per HCF, since we have to come up with the requisite money to pay Springfield for the water we buy from them. It is a question of fairness. We have to pay Springfield a fixed amount, so shouldn’t the largest users pay the largest amount? And not at the same rate, but at a graduated rate? A flat tax rate is unfair and a flat water rate is unfair. LongmeadowBuzz is an open forum for discussion of local topics of interest to the residents of Longmeadow, Massachusetts. The LongmeadowBuzz blog is not supported financially or in any other manner by the town of Longmeadow and all opinions are strictly those of the listed author and do not represent official town policy.